Rio Tinto: "We remain fully supportive of our detained employees"
HONG KONG, China (CNN) -- Mining giant Rio Tinto has commented for the first time on bribery allegations in China against its employees, saying the claims are "wholly without foundation." 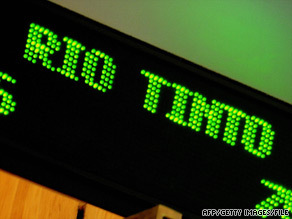 Rio Tinto signage scrolls past the opening bell at the Australian Stock Exchange in Sydney on June 5. Earlier this month China detained four employees in Shanghai, including an Australian citizen, on charges of stealing state secrets. According to reports by government news agency China Daily, Rio Tinto is accused of bribing officials from China's top 16 steel mills to obtain market information. The case has reverberated around the business world because of the growing importance of China for the global market. As developed economies struggle with the recession, China just reported this week GDP growth of nearly 8 percent from April to June. "Rio Tinto believes that the allegations in recent media reports that employees were involved in bribery of officials at Chinese steel mills are wholly without foundation," said Sam Walsh, chief executive of the company's iron ore business, in a statement on the company Web site. "We remain fully supportive of our detained employees, and believe that they acted at all times with integrity and in accordance with Rio Tinto's strict and publicly stated code of ethical behavior," the statement said. "Rio Tinto remains very concerned about the four employees detained in Shanghai. The Australian Government is keeping the company fully briefed on its efforts to assist them. Rio Tinto will continue to work to support the employees and their families and colleagues." A Rio Tinto spokesperson wouldn't comment on claims in the Australian media that the company has pulled staff from China, but the statement on the company Web site says, "Rio Tinto continues to operate in China and is maintaining high levels of iron ore shipments from Australia." Rio Tinto was involved with negotiations on setting iron ore prices in China at the time of the arrests. China was demanding a cut in price larger than the 33 percent offered by producers -- a cut accepted by neighboring nations South Korea and Japan. "Last year since October, the Chinese steel industry has suffered very hefty losses because of the plunge in steel prices, but they still have this high inventory cost which they acquired at the height of the iron ore prices," said Xianfang Ren, a senior analyst at Global Insight. Other reports in state controlled media say mining companies have wined and dined by the Chinese iron ore negotiating team -- not illegal, analysts said, but questionable. Building relationships, or guanxi in Mandarin Chinese, has long been a part of Chinese culture and crucial to doing business here. "The line between entertainment, public relations and government relations, and bribery, commercial bribery - it's kind of blurred here in China," Ren said. The incident comes after Rio Tinto broke away from a $19.2 billion investment deal with state-owned Chinalco last month. The deal with Chinalco was signed in February and was awaiting a review by Australia's Foreign Investment Review Board. The deal soured as opposition party members ratcheted disapproval, saying it put Australian resources at strategic risk. The week after the arrests, Chinalco released this statement: "Chinalco has been in contact with Rio Tinto expressing our mutual concern for the current situation with their staff. We have also reasserted that the situation is in no way related to any commercial dealings between Rio and Chinalco." Both the U.S. and Australian governments have weighed in voicing concern about the arrests and transparency in doing business in China.